When the price of the Icom 7610 was announced in the US, many reservation holders started looking at the Flex 6400M as an alternative. The Icom 7610 is priced at $3,899.95. The Flex 6400M is $2,999.00 (add $300 for the auto tuner). That’s a pretty big difference and they are comparable SDR transceivers. The Flex 6400M has knobs too! Why did I choose the Icom 7610 over the Flex 6400M? When I saw the price and researched the Flex 6400M, I almost persuaded myself to go with the Flex. The Flex 6400M has a few knobs and I love the touchscreen. It is hands-down the best touchscreen on any HF rig. It’s an 8″ IPS touchscreen with a resolution of 1920 x 1200 and there is a HDMI output on the rear. The IPS touchscreen alone almost got me. See the Icom 7610 info below. I wouldn’t have bought the auto tuner, so it would have been about $900 less than the Icom 7610 (not really a feature). Two VFO knobs on the front. The Icom has just one, but you can add the RC-28 remote control USB encoder. Flex 6400M remote operation with Smartlink looks like it’s a breeze. Use an iPad or PC without any hassles! Full Duplex (with stipulations) The Icom doesn’t have it. 7 MHz panadapter bandwidth. I would love to see that much of the bands on a 30″ monitor. It may be too much for me to handle 😯 The Icom 7610 has 1 MHz. Dual RF Direct Sampling Receivers. Independent receivers, separate antennas. The Flex 6400M shares the same antenna with the receivers. I/Q signal output from the USB connector (provided in future firmware). Both radios have I/Q output. RTTY (FSK). The Icom 7300 spoiled me and I enjoy FSK. The filtering is superb. The Flex 6400M doesn’t offer FSK. The Icom 7610 has a RS-BA1 server onboard. No PC required at the rig for remote access. Similar in both radios. (2) USB ports on the front for either a USB stick, keyboard or mouse. There is an SD card slot on the front too. (2) USB ports on the rear, one is USB 3.0. The Flex 6400M has (2) USB 2.0 ports on the rear. A and B external speaker jacks on the rear. Flex has one. Microphone, phones and key jack on the front. The Flex has 3.5mm jacks on the rear. Dual clock displays on the front. Convenient! The Icom 7610 has a 7″ touchscreen that is 800 x 480 resolution. It’s much better than the IC-7300 and better than the IC-7600. I like the layout and Multi Function Meter display better than the Flex 6400M. There’s also a DVI-D video output on the rear of the IC-7610. Just one of many display options. There is a lot more, and I mean A LOT MORE, to these radios than the few things I threw out there. As far as specs and features go, they look pretty equal. I enjoy using FSK with N1MM and MMTTY in RTTY contests. The twin peak filter is very effective in RTTY mode. My familiarity with Icom and the Icom 7300 is a big advantage. There’s not much of a learning curve for me. The IC-7300 really delivered and I’m confident the IC-7610 will too. My LDG AT-600ProII external auto tuner connects to this rig just like it does on the IC-7300. NR and NB are proven to be effective. I need this. The Icom 7610 front is not as software (menu) driven as the Flex Radio. Operating without a PC will be better with the IC-7610. The Icom IC-7610 just flat out looks better than the Flex, IMO. That is what tipped the scales in favor of the Icom 7610. It was close between the two and I am sure I’ll have a Flex someday. They make great SDR transceivers in my opinion. Surprisingly, I got a free Heil mic from HRO with the purchase of the IC-7610. It should be in my shack early December. I’m keeping the Icom 7300. There is still more to do with it. What do you think about these SDR transceivers? Did you decide on the Flex 6400M? Getting the Icom 7610? I was able to try out one of the flex 6600 M transceivers at last year‘s Hamvention and really loved it. I agree both Flex and Icom have some great radios, hopefully the others will catch up, hi hi! I don’t know if it is worth mentioning that the knobs on the Flex 6400 are pretty darned nice. No cheap feeling here. I’ve been using my 6400M for several months now and it is a joy to use. I will admit that much to my surprise I have taken to using SmartSDR on my computer more, and the transceiver face less. I never liked Ham Radio Deluxe as a radio control program (love DM780 though) but Flex’s SmartSDR looks gorgeous on my wide screen display and I find myself using it more and more. Thanks for commenting Roger and it’s nice to hear from you. It’s good to hear some other thoughts on that. 100% on the Smart SDR. It’s a slick program and the visual is unbeatable. Am getting the 6400 for now. I used the SDR1000 from inception, in 2003. It has worked with a 4-1000 Amp at 19?? watts with no problem. 🙂 I do like the fact the 6400 and 6700 have a 3rd order preselector (+ for the 6700). Some $10,000 radios in the past paid for that. R-4C/CF-600/6 at 130 dB is the winner for slicing adjacent channels. Interesting but true. Nice to hear from you and thank you for the comment. It is very interesting to see the test data. If receiver test data was the only criteria I used, I would save up and buy a Flex 6700. I see the 6600M on the list, but not the 6400M. Maybe he hasn’t tested it yet?? Thanks for commenting and I look forward to seeing more test data. Meaning no offense, but reading this review, I can summarize it pretty simply: “I chose the Icom over the Flex because it has better knobs and I like Icom gear which I have owned in the past and am therefore familiar with.” Nothing wrong with that, both radios are good enough to go with. I do a lot of digital, SSB, and CW, roughly in that order, and I was in a position to buy any radio I wanted. I chose the Flex 6400M for many reasons. Firstly, the resolution from the Flex on my PC screen is fantastic. Secondly, playing around with both radios, the Flex simply seemed like a better-designed, more intuitively set out radio. Thirdly, I loved the way the Flex receiver sounded. Lastly, doing some reading, the Flex is a much purer form of SDR than is the Icom — the Icom seems like a legacy radio with an SDR front end. The Flex is SDR in its pure form. These are just my impressions. I didn’t spend a LOT of time with the Icom, and no doubt it has virtues that I missed. But I’ve never regretted going with the Flex. Oh, and it is worth noting that the Flex staff and the Flex community are a joy to work with. I had some questions about setting up WSJT-X, for example, and within an hour or so one of the Flex users posted a You Tube video showing exactly how to do it. And it worked the first time for me. No offense taken and it’s nice to hear from you. I value your input. Both radios would work for me and I understand your thoughts. It makes sense and I would enjoy using a Flex 6600M/6400M. Yes, the knobs and FSK are important for me. I had the chance to sit down and operate a Flex 6600M at the 2018 Hamvention and I honestly like the knobs, ergonomics and feel of the Icom 7610 better. So I made the right choice for me. The resolution of the Flex is better and I would really enjoy that, but that’s for another day, hi! Thank you again and I am happy to hear your thoughts on it. I have the 6400+Maestro and love it. My 7300 is my backup. Icom and Flex are both excellent. Nice to hear from you. Yes that MB1 looked great at the Hamvention.I am sorry I missed the presentation they had. I think you’re right about the price, but for the right Ham it looks like a winner. Thanks again and nice to hear from you. Since my Alpha 8406 takes three minutes to warm up my Anan power up sequence which is about a minute doesn’t bother me. Instant on is not a big deal. With the Anan I turn on mutilple pieces of software in a specific sequence before I power up PowerSDR HPSDR 3.4.9. Not a big deal for me. I don’t think the 6600M unit takes that long to power up. I used a 6600M during a contest and I don’t remember it taking much time to power up. This discussion is so interesting to me because everyone has a preference. I owned a 7300 for about two weeks but didn’t like the no direct output to a large screen without the RS-BA1 software. Also the inflexibility of that software to change the panadpter size which is terrible looking bothered me (maybe this has changed by now). I think if I ever own the 7300 again it would be for a backup rig and as a nice possibly portable. Once the used prices come down to the $600-700 I am likely to scoop one up. I like the Anan for other reasons not stated in previous post. With all the open source possibilities of the Anan and creativity it allows developers to create new firmware, protocols and software the Anan is an exciting and flexible platform. I work in tech and open source is a big pull for me. The Thetis protocol which should be in the next stage of wide release soon should offer increased capabilities. Of course I already mentioned the relays which I don’t care for in the Anan and the U/I is not terribly modern albeit it is functional. A new sexier panel based user defined U/I would be nicer for sure. So at the end of the day there is no perfect radio so far but I keep looking. I own and use an Anan 100D as my daily radio and it is a fun radio. I am very casual operator primarily interested in 6m where the Anan 100D really shines. It is sensitive and the HPSDR software is very good. There are certain things that I think are not so good and my biggest issue with it is the loud T/R relays and no QSK. This is a real bummer for me as I like QSK operation very much. I am leaning towards a Flex 6400M over the Icom 7610 but I would mind having both. I like the polished look of the Icom 7610. I have used the Flex 6600M during a contest and it is a very nice radio but I was not in love with its form factor. That is an entirely personal opinion so like anything else take it with a grain of salt. The low resolution output of the Icom 7610 is a complete downer. I had a good friend buy one and own it for a couple of weeks. He raced about the receiver and the APF and Noise Blanker but hated the low resolution output. I am a stickler for external display and this is a real bummer for me in regards to the 7610. Will the choice come down to a more polished box, better display or who has the better QSK. Tough and fun decision ahead. I agree the low res output of the 7610 is a bummer when compared to the high res of the Flex. The Flex LCD is also larger and a better resolution. That being said, I had a chance to feel and play with the 6600M and Maestro at the 2018 Hamvention and I am happy I bought the Icom 7610. The tuning on the Flex and it knobs are high quality and it feels good, but it is just not the same as the 7610. I prefer the ergonomics of the 7610. Of course I am probably a little bias now, hi! Thank you for commenting and either of these radios will be a nice addition to any hamshack. I don’t think you can go wrong. P.S. I was told the Flex takes about 1min and 45sec to boot up! That, I would not like. It is nice to hear that the QSK on the IC-7610 works well since that is a requirement for my next rig ( as well as being able to work with a amp without hot switching). I never hear anything about how the T/R switching is handled on the Flex Radios though. Are they good at QSK and CW ? Nice to hear from you and that’s a very good question. I do not know about the Flex. I had heard they were difficult a while back, but I think CW issues have been resolved with new software and these new “M” rigs. Maybe someone who has a Flex can chime in on this topic. I’ll have a Icom 7610 CW demo from the Hamvention on my YouTube channel shortly. It is “Ham Radio with K0PIR“. Seems to me from the reviews and comments that the Flex 6600M is the technical winner. Personal preference and price could be reasons for either the 7610 or 6400, if you can accept the technical differences in one of those two. Nice to hear from you. It was a close call for me, but I’ve very happy with the 7610. I actually got the lower price $3,489 because I used my Discover card (Price Guarantee) and R&L Electronics had a sale on them the first week they were out. Thank you R&L! The 7610 is a high quality transceiver. The look and feel are worth it to me and I’ll be putting my 7300 in the camper for this summer season. I like the ergonomics of the 7610. It is better than I expected. Technically the 7610 fits the bill for me. No complaints here. I am sure Flex has a winner and I look forward to having one someday. One with knobs, hi! Thanks for commenting and I look for to hearing you on the air. Up until a few weeks ago I owned a Flex 6300, Flex 3000, and a Icom 7300 at the same time. Once I got the 7300 I stopped using the 6300. The 6300 is a great radio and the Smartsdr software is beautiful to behold , and frankly can do more than a 7300. However the simplicity of the 7300 really got me hooked and I used the 6300 less and less. I liked not have to use a PC in addition to a radio. I liked not running in to finicky virtual serial ports and using applications like VSPM and DDutil that sometimes had minds of their own that need tweaking to keep working correctly. I did not like the excessive installation of more DAX audio than is needed for a 6300. Then, I received notice my Flex 6600M was almost ready to be shipped, once payment was sent. I thus sold my 7300 to raise to 6600M related cash . I stopped using the 7300 and shipped it to California and went back to the 6300. After 2 days I really missed the 7300 despite the many extra capabilities of the 6300. I tried to use the 6300 to run some digital modes like VARA, ARDOP and Winmor and performance was poor. ARQ modes and a Flex have a difficult history, but I was not sure it was some other problem. So, after several days of missing my 7300, I sold the 6300 too and, same day, picked up a 7610. I decided to wait a few months to get a better sense of the 6600M reviews . If the 6600M comes in with high ratings, I figure I can sell the 7610 for a couple hundred dollar loss . However, the 7610 has performed much better than my Flex with VARA mode and a few other ARQ modes , MUCH better. No having to fine tune settings and find ways to address latency issues. The 7610 IS much quieter than the 6300 , but perhaps not the best Flex to compere it to. The NR on the 7610 does a much better job than NR on the 6300 with SmartSDR. The ability to use a mouse with the 7610 and hook up , via DVI, a large screen TV is a big advantage over the 7300. The Flex 6300 and other Signature radios do have advantages in terms of simultaneous decoding of digital modes. With a Flex you can be decoding FT8 on 80M and decoding RTTY on 40M. With a Flex 6600M you could decode 4 different digital modes on 4 different portions of a band (or bands) . With a 7610, as best as i can figure out, you can only decode one digital mode on the MAIN VFO, the second VFO is essentially a “listen only” application… listening only to the audio signals you can’t direct the signals in the sub band to software for decoding. You have to switch these signals over to the main band if you want to pipe them over to WSJT or Fldigi. At least that is what i have found so far. Even with the build in RTTY and PSK decode cpability of the 7610, you can view BOTH decode screens at same time . So, the 6600M seems like you will be able to do much more with it than a 7610 , if you are a user than multitasks and wants to be active on many bands at same time. When I used a 6500 in the past for several months I found that the ability to operate on 4 bands at same time was novel but I quickly settled in to one or two bands at a time only. With a Flex I spent more time fixing software related glitches (mostly pilot error or Windows annoyances, ) . So I am happy that I got close to the price of a 7610 by selling my 6300 and 7300 and I have a radio that is easier to use and at least allows me to operate on one band and surf the other bands via the sub band. I have not ruled out a 6600M , but my aging brain seems happier with the ‘easier” Icom that also handles ARQ much better. I don’t view it as a Ford Focus versus a BMW (as Ria did) . I see it as TWO BMWs with the same model name , the 7610 is the base model and the 660OM will likely be the the one with heated seats, convertible roof, better gear box, and driver less parallel parking. It’s nice to hear from you and thank you for the nice comment. It is very good to hear from a owner who has both Flex and Icom. I’m glad you like the 7610, I do too. I like the knobs and ergonomics. I picked up on something you mentioned and that is how a flex can decode 4 different digital modes and the 7610 only one. That would be something I would be interested in looking in to. I like that perk in a Flexradio. I agree about the software and the Flex radios. When I had the Flex 1500 I did not like all of the software that had to go along with it. I believe the 6400M, 6600M will be different. Hopefully there won’t be a lot of downtime or glitches associated with software on those radios. I’m glad you mentioned the NB on the 7610. Mine works fantastic and so does NR and AN. The MNF is also very good and comes in handy at times. I have seen where others don’t think the NB works good, but that has not been my experience. See: Icom 7610 Noise Blanker NB Noise Reduction NR in Action. I love the 7610 and it does everything I need, however I would like to try a Flex 6600M. Maybe someday! Thank you again for the comment and the experience you provide. It will certainly help others. Glad to see you enjoy your IC-7610. I saw a video on YouTube yesterday and looks awesome. I have still my Flex-6300 and although entry level in Flex 6000 family I was impressed what I could do. New 6400M is interesting and I was initially thinking about it. Maestro alone had a price tag that was discouraging me (you may have a separate rig for that). I moved recently to 7X land for some time, applied for local license to be back on the air and in meantime working remotely from within US. This is a whole new experience and most of the operators are surprised working me this way. to go with IC-7300 instead and not even bringing my 6300. The main reason is that it’s small, does everything I want without complicated PC setup and it’s cheap or I should rather say good price/features ratio. Especially if for any reasons might be lost or unable to re-export back home. Yes, I witnessed some troubles with Windows 10 and SSDR (uninstalling and reinstalling with some manual console commands) but and the end got used to that. Will see what will buy next once my assignment in 7X ends. It sounds like the 7300 is a great choice for you. I like it a lot and will be using it for portable operation myself this year. As you said it is small and does just about everything. Hooking it up to a small laptop is very easy too. I think I would like to try a tablet with it. I’m anxious to see the 6400M in operation and hear it on the air. I’m sure it will be a nice addition to any station. Maybe I can pick one up someday. Best of luck to you and enjoy 7X. Take care. Wow this thread has been going on for a while. I’m a current Flex6500 user. I have an order in for a Flex 6600 (non-M model) as I do not see myself using the front panel at all. Since I like to build things if I want knobs I will build my own interface. My plan is to mount my 6600 in my “ham shed” where my tuner and amp reside. It is a short 20 foot run to route mic, key, speaker, and foot pedal wires to my op location. All my antenna feeds come into that shed. 1) I want to support an American radio company. I think they are doing a good thing and I want to be apart of that success. 2) I op from many different locations. Some is at my op position where I have two 29 inch monitors and a nice PC. From that location I can do anything I want including CW, Voice, Digital with just a few clicks of the mouse. I can also do ALL OF THIS on my laptop sitting in the living room watching football. 3) I can easily op all modes remote on my work PC, work laptop, iPhone or iPad. The iOS app for flex is pretty darned nice. 4) Unrestricted TX bandwidth. I do find I enjoy SSB at 4.0+ bandwidth. I’ve gone as high as 8 kc. Yes if the band is crowded I go much narrower but sometimes for a ragchew some of my friends and I open it up. It seems the 7610 is hard limited to 3kc. 5) Flex provides a reasonable API. I’m a software developer by trade and writing small utilities and software for the Flex is a snap. In fact yesterday I wrote a short piece of code to drive my flex transmit slice from band edge to edge in 5 kc increments. At each stopping point I toggled the tune feature on my SPE amp, then toggled the tune feature on the flex and waited until the SPE amp said it was tuned. I started this program running and went upstairs for breakfast. I came back down and it was completed. Now just about anywhere I go on the bands my SPE amp internal tuner has matched the antenna at that point. I have a few places that are just off enough that I have to use my HF Auto tuner. But most of my op spots are just change and go at full power. While there have been a few failures of the early 6400 and 6600 models from flex I am confident they will support them and figure it out. Most of the failures have been M model related anyway. In scanning the net I have seen a few IC-7610 failures as well. In my past experience a fix with Flex is US shipping and some fix wait time. A fix with Icom has usually for me been a month to two month turn around. So I’m going to stick with Flex. I’m hopeful that by the time I get my 6600 they will be solid. I have not traded in my 6500 yet as I may want it as a backup. I selected the 6600 for the dual hardware receivers and for the better filters. I’m not a big DXer or contest op but I do like having some abilities in the rig. I would love to hook up with a 7610 owner on the air and talk about their likes and dislikes. Thank you for the nice comment. Given your information I would think the Flex is a very good fit as well. I look forward to seeing the Flex 6600 and 6400. I am sure both will be a great success and for me I would like to try the (M) model someday. Coming from the IC-7300 it was very easy to make the transition to the IC-7610. I am very impressed with the 7610 and have not experienced any problems. The ergonomics are very nice in my opinion and I don’t think Icom missed anything necessary. The front end, knobs and buttons, are high quality. I really enjoy using it. Tuning is very smooth and the LCD touchscreen is nicer than I imagined. It has an effective APF and TPF. CW operators really enjoy this rig as well as RTTY (FSK) operators. QSK is very nice. NB, NR, AN and Manual Notch are highly effective at my QTH. The incremental ATT is absolutely awesome! For software there are so many programs to choose from. I like the PC over the Mac, but I’ve found it works very well with MacLoggerDX. Currently I am using it with DXLab Suite and enjoy WinWarbler with PSK31 and RTTY. Digital modes are a breeze to get going and work flawlessly. I don’t do much contesting either, but hope to do more with this radio in the future. I am sure it’s going to be popular with serious contesters, especially CW operators. I’ll continue to brush up on my CW. I love the receiver and at this point I would not want to change radios because it sounds so good on receive as well as transmit. I had the opportunity to listen to another “Brand” radio a few weeks ago and I seriously thought there was something wrong with it. Turns out I’m just used to the receiver on this radio. SSB 4+ doesn’t appeal to me, but I know many others who want it and it’s missing in this radio. I’ll do a review in the future when I have had it a bit longer. Thank you again for the comment and adding value to this thread. I am sure you will enjoy the Flex 6600 and I hope it’s a great success. Got my new IC-7610 yesterday from DX Engineering. Immediately upgraded the firmware to the latest V1.06. It works perfectly. No issues at all, used it on SSB , CW, split, everything but the digi modes. I have the RC-28 too. Today I will hook it up and see all about it. I am delighted with the radio. The background noise is noticeably very low ! So far so good ! Great to hear it. It’s an exciting radio! I have been trying to decide between the 6400M and the 7610 since both have very nice features. As of today I realized that Flex, is dependent on MS for Windows10 OS, and is vulnerable to driver loss with Windows10 updates, which will occur frequently, indefinitely and cannot be discontinued. I understand those issues are solved by completely deleting the installed SmartSDR software and reloading from scratch but that’s a chore. Looks like I’m staying with the Icom line which uses a proprietary in-house written (Linux-based ?) OS. I expect Icom to be pretty cautious about drivers during (voluntary) software updates. Considering the relatively recent initial release of the 7610, it appears to be relatively bug-free and the few things that have popped up have been quickly fixed. Nice to hear from you and thank you for the nice comment. I have seen where others have had trouble with Flex software, but I didn’t take it into account. I guess I should have. I know there can be issues, especially if you like to do some contesting. That’s just what I’ve heard. I guess the proof is in the pudding. Will the 6400M and 6600M be any more reliable than the say, 6300??? I am very happy with the Icom 7610 and it is better than I expected. The LCD touchscreen is very nice and the receiver is excellent. CW and RTTY (FSK) are both very quiet and very smooth. No glitches, knock on wood. I like the front end and I think ergonomically it is a very satisfying rig. I use Windows 10 and am having a good time with DXLab Suite right now. It was working very well with HRD and ACLog as well. WSJT-X works great too. I didn’t experience any bugs and I think the firmware updates have cured at least the one tone issue. You can find out more on the IC-7610 Groups.io forum. Thank you again for the informative comment and best 73! Thanks for the link. That’s a great looking rig and it’s really worth deeper consideration. I have an Icom-746 (not Pro) and am thinking of upgrading. I am in a noisy urban environment. Am mainly looking to improve reception. Would also be nice not to have to manually toggle between the DX and the pileup, but rather have one in one ear and one in the other. So… with the 7610, can you send one receiver to the left ear of the headphones and the other to the right ear? In addition to the pileup situation, this seems like it could help with two separate antennas, for digging CW signals out of the noise (i.e. “diversity reception”). What is “AFP”? It’s nice to hear from you and thanks for commenting. Great questions. Yes, with the headset, the main can be in the left ear and the sub in the right ear. It is a nice feature. Thanks for commenting and I hope this helps. Great discussion on the Flex vs Icom radios guys ! I am on the edge of the fence as to which way to go. Either the Flex 6400 or the IC-7610. I have an IC-7300 and it is a great radio. Was thinking of selling it and using the proceeds to help pay for either the 6400 or 7610 but it is a great radio and can’t let it go. I work mostly CW split and either radio I’m sure will do the job nicely. Two things that concern me, one is the NB/NR on the Flex, from what I hear they haven’t been that effective from SmartSDR so far but the new V 2.1 coming which the 6400 will use is supposed to be significantly improved. Users of the 7610 say the NB/NR performs very well, better than the 7300 which works really well. The other concern is the better resolution with the Flex display compared to the 7610. Maybe that is not an issue for me, I don’t have huge widescreen monitor. Its widescreen but only 19″ How does the resolution suit you with the 7610 on your monitor ? I have never had a Flex type SDR radio before, all things being equal I like the radio feel of the 7300 with knobs and switches and the 7610 looks to be a good operating radio too. It’s nice to hear from you and thanks for leaving the comment. It doesn’t get posted until it’s approved, so thank you. Honestly, I have not been using an external monitor with the 7610. I have a 20″ monitor that I was using it with, but the LCD touchscreen on the 7610 is so very good, I just don’t bother with the external. The mouse control is limited on the monitor and LCD touchscreen as well. The resolution is okay, not great. I know lots of guys are using the external and are happy with it. I’m waiting to see what Icom does with the high speed UBS 3.0 port on the back. We may be able to use something like HDSDR with it and I would jump at that opportunity, even with a limited bandwidth. It would be easy to hookup and get operational. I chose the Icom 7610 and really love it. The Icom 7610 is a CW operators transceiver. The AFP is exceptional. Just ask around and others will tell you. The NR/NB are very good and I think it’s a little better than the Icom 7300’s NR/NB. Adam just came out with his report on the 7610. You can find it here. Nice site. I look forward to more content in the near future. I tried to leave a comment earlier but it didn’t go thru. Here goes again. I am on the edge of the fence on either a 6400 0r a 7610. Great discussion ! The flex has a higher resolution display than the Icom. Has that been an issue for you ? I don’t have a huge widescreen monitor, mine is 19″ Maybe OK with the Icom ? Even though I am not using the external monitor with the IC-7610, I haven’t missed it. The LCD touchscreen on the 7610 is absolutely the best of any radio I have seen. It is top notch! The tuning on this radio is so smooth and I can jump from signal to signal effortlessly. Just in the XE RTTY contest I had the Spectrum Scope set to Center, Speed set to Fast and Span set to 5k to 10k. It is a dream to operate. I’m very happy with it. I placed my pre-order for Flex 6400 back in November and FLEX just informed me by E-Mail they will begin shipping radios immediately. They have been working on the newest software release for the new 64 and 66 while validating backward compatibility to older radios. This makes me happy because FLEX is continuing to support legacy radios in the field with new features. Before making my decision, I sat down in front of an ICOM 7300 several times, and the receive sounds nothing less than wonderful. Today (Jan 11, 2018) I sat with the new 7610, (Ham Radio Outlet, Denver) and to my immediate ear, it sounded a bit better than the 7300. Alas, I am not sure I want to throw down $4k (including taxes), on the ICOM, when the receiver audio and ADC specs of the 6400 are mostly identical to the ICOM 7610. Other features not withstanding, I am looking forward to DXing with this new FLEX SDR. I have owned and used two flex 6300 and a 6500 over the last four years, all used heavily for hf and 6m contesting, and transverting onto 4m. I was tempted by the Anan 100 but decided the flex would be more user friendly and better graphics – which turned out correct. I was planning on buying a 6600 to replace my 6300 due to wanting so2r dual rx facilities . I bought an ic7300 earlier this year, to replace my transverter for 4m and have used it in major contests since September as the ssdr software has become unreliable for contesting ( frequent disconnects and crashes). That fact, plus the delays in the new flex radios coming out have led me to opting for the new Anan 7000dle. I wanted a full dual rx sdr to play with on lf over the winter for diversity, and there was also a 5% discount last weekend bringing the price down to £2949 delivered – better diversity facilities and noise reduction facilities than the flex, a squelch that works, and pure signal pre distortion for cleaner tx signal. I have only had around 4 hours with the radio so far due to business trips away since last week, but so far I am impressed with the more mature client software and the speed of development going on. Will still be interested to see how the new icom and the new flex radios pan out in time for contesting use, but in the meantime I am going to be putting the Anan through its paces on lf hf and 6m dxing and contesting. Nice to read your comment and thank you for the information. I have never used an Anan and I am sure I would like it. I like my 7300 too and won’t get rid of it. It’s been very reliable and a good size for portable operation. I remember Flex software having issues and yes, I can imagine it’s a real pain to restart a computer while people are calling for you on the air. I wonder if Flex will ever get ThumbDV up and going. I saw that advertised and am very interested in it, but I heard it has problems. I’ve heard good things about Anan and the software looks fantastic. Thank you again for commenting and I hope your new Anan is everything you wanted. I see you like the Flex 6400-M, when did you get delivery of yours? Thank you for coming by and thank you for commenting. It’s nice to meet you on here. You mean the Icom 7610. I got it last Thursday and love it. It is a fun radio to operate and as I suspected not much of a learning curve from the Icom 7300. Almost plug and play. It is very quiet and I am very, very happy with it. Thanks for the reviews. It seems that there are quite a few of us, including myself, who have decided that one of theses two radios will be in our future. I’m leaning toward the Flex, because of the company’s long history of producing SDR radios, vs. ICOM’s rather recent entry into the field. PS: Is the 7610 a kind of “hybrid,” rather than a “full” SDR? Thank you for leaving a comment Dan. It was a close call for me, but the Icom 7610 just felt like the right one for me at this time. It slid right in place of the IC-7300 perfectly. No hassles and almost no learning curve to get it on the air. I look forward to getting a Flex, hopefully sooner than later. I really like the IPS touchscreen and HDMI out at high res. For the question, I can just refer you to this fine article. Thanks Dan. Best wishes to you and yours this holiday season. Hello! Nice assortment of information on the Icoms and the Fkex radios. My point is that you might also consider the APACHE-LABS radios. I have an ANAN-100, and I have owned an ANAN-200D. To me, the HPSDR , as it’s feature rich software package (which is being upgraded at a rate that it is hard to keep up with!) is the major selling point as well as the versatility of the BNC ports on the rear of the radio. It was the SOFTWARE that caused me to get rid of the Flex-6500. As I said, i have owned many SDR’s and the ANAN is the king of the hill for ME. The IC-7300 and IC-7610 offer a compelling set of facts such as the fact that you can run these radios without a computer, and the 7610 has a server built in for remote operation. Sorry you were having trouble with the fields. I’ll look into it. Thank you for mentioning it. Yes, the ANAN is on my list too. If I run across a used one, I might get it. I would love to see what it could do receiving and I’ve seen HPSDR, it looks fantastic. I tried to run it with my RTL-SDR and DX Patrol, but to no avail. I’ll have to look into it some more. Thank you again for commenting and adding value with your information. Best 73. Have a great holiday season and I hope to hear you on the air. BTW… I run RTTY on a Flex.. there is NO NEED for FSK in a MODERN SDR because the entire RTTY path is totally digital already and no complex interfaces or setups are needed. A further benefit is that I can typically hear about 6dB better on my Flex because the entire path is digital so there is no analog to digital to analog conversions needed. This really shows up on FT8 where I always hear about 6 dB better than non SDR radios hear me. BTW… I hope you asked for the $500 discount? Wow, that’s great to know, glad I used my Discover. Maybe that’ll work in my favor. It’s a sale price and Icom did not discount it, the radio store did. I’ll see what HRO does with the price too. Thanks again for the info Howard and have a Happy Thanksgiving! P.S. Glad to see my website is making it into the Flex community. I’ll be back there regularly someday. I got an e-mail confirmation just the other day from Discover Card and received approval for my cash back. So, thank you again and thank you R & L Electronics! I just bought a 7300 for $999 after rebate. I figure that is a pretty good price and will hold me over until prices drop on the 7610 and reviews roll in on both radios. Not sure why Icom had to come in so high on that radio, had one on reserve but $3900 is out of my budget. Nice to hear from you and thank you for commenting. Yeah, that’s a great deal on the IC-7300. There will probably be some more to be had on the used market. I thought about selling mine, but I’m going to hold off for a while. I have more to do with it and I think I want to put it in my camper full time. That way I can check into my early morning nets while camping. That $3,900 was out of my budget too. I bit the bullet and will see if it is worth it. Thank you again John, best to you and yours this Thanksgiving and Merry Christmas, hi hi. Hardware wise, the 6400 to 7610 is not an apples to apples comparison. The 6400 only has one ADC because it’s the lower end of the Flex-6000 line, replacing the 6300. A more appropriate comparison would be the Flex-6400 to the icom 7300 where the 6400 would win in nearly every category except that it’s a bit more expensive. And the 7610 should be compared to the 6600. The 6600 starts at $4000 list, just like the 7610. Yes, you do need a computer for that model but I have never found that to be a hindrance. For $5000 you have the 6600M which adds in the built in control panel. So please, let’s not compare a BMW 5 series with a Ford Explorer. Let’s not forget that with the 6600 you’re getting four slice receivers with the two ADCs. With icom you only get two. This is helpful to me because I can work DX split on one band while rag chewing or monitoring FT8 or WSPR on another. Has anyone confirmed exactly how much I/Q out you’re getting from a 7610? I’ve heard that they tap it off at the final IF so it would only be 12kHz. That is a really small amount of bandwidth. Even the cheapest $10 softrock gives you more than that. With the Flex 6500, 6600 and 6700 you can get as much as 192kHz. That’s most of the CW portion in most bands. It would be helpful if they released that spec. … multi client. In the near future you will be able to have two or more clients accessing a flex-6000 radio at the same time. This is a killer feature for multi single contesting. It simplifies wiring and allows someone to use one radio for a complete M/S solution. You need full duplex for this to happen and icom doesn’t offer it. I also have a number of different interfaces available to me with a flex 6000. I can take a maestro and go outside, use a PC or Mac, or use my iPhone and iPad. I’m not tied to RS-BA1 and windows. I’m not tied to the front panel. But even though icom makes a pretty radio, their display is only 800×640. With the 6400M and 6600M it comes with 1920×1200 and can display this on an external monitor via HDMI. Finally – FSK. I don’t get why many hams are hung up on FSK. With DAX (digital sound card) on the flex you get the same signal purity as FSK RTTY. In fact with DAX receive I get superior signal decoding. Working weak as dishwater 9U4M on 30 RTTY while my friends didn’t get any decodes made me smile from ear to ear. But, if hams want FSK, I have already relayed this to the flex dev team. I don’t see it as a deal breaker. The most popular FSK mode on HF is FT8 and 99% of people are using AFSK for it. The 7610 is a nice looking radio, well laid out and will sure to appeal to many but if you want the best of the best, Flex still is it. Hope this clears up some things. Thank you for your nice comment and the information you provided. I have seen comparisons of the Icom IC-7610 with the Flex 6600, but I didn’t want to get into that, hi hi. I agree with everything you said. You provide some deep and valuable information. Thanks and please stick around. I’ll have some hands on experience with the IC-7610 when it arrives. and when I had two signals together you could not tell where they start or end big blob, well Ria I too favor the Flex-6600 and my Maestro take it everywhere no problems imagine taking the IC-7610 to a coffee shop, all and all good radio but like any other radio it has its likes and dislikes. Nice to hear from you and thank you for your input. I still enjoy my 7300 and it is a great rig as you say. I am not sure why you had a problem with the IC-7610 LCD screen. I have no issues with the screen and everyone I know that has one is impressed with it. For anyone interested, the October issue of QST has the IC-7610 review. Also there is new firmware (v1.20) just released for the Icom 7610: The [USB 2] I/Q baseband signal output port is now supported. I will chime in with one comment about using external monitors with the 7610 or 6400M – The 6400M has HDMI out which supports 1920×1200. The 7610 output uses DVI which will support 800×480. The Flex will look much sharper than the 7610 when on an external monitor. The other thing to clarify is operating either radio can be done easily without a PC. There is no need for a PC when using the 6400M. Your statement “operating the 7610 without a PC is better” is a false statement. The 7610 will be a fine radio if you choose to go that route but I just want to clarify some statements you made. Nice to hear from you and thank you for the information on the Flex 6400M HDMI. I agree it is much better than the output on the IC-7610. 1920×1200 external output won’t do me any good right now. Neither of my monitors are capable of it. I understand the IC-7610 DVI-D output is capable of 800×600 or 800×480. I’m anxious to try it out. P.S. VK’s are reporting the Icom IC-7610 is selling and “flying off the shelves”. I had a quick review and I wanted to comment on a few items. While the 7610 will have IQ data available, the 6400 has IQ data available on both Slices today. Since you will be feeding the IQ data to a PC program, no addition cables are required. IQ DATA is provided by the Flex DAX (Digital Audio eXchange). The 6400 does have 3rd Band Pass filters which make it great for Field Day or other high HF RF areas. I am not sure if the 7610 has similar. The 6400 does have an amazing Wide Noise Blanker that has done a great job on urban noise especially on the low bands. Look at YouTube for some examples of a dead band going to a usable band. Cool stuff. The front panel is a very personal preference. Some find them too cluttered some find them to not have enough buttons. Don’t kid yourself about the 7610 not being as much ‘software driven’. There is as much software in the radio as any radio, especially an SDR. 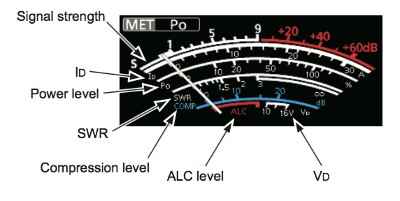 Flex does have a similar multifunction meter so you can see Power, Audio Level, Compression, SWR, ALC, and S-Meter at the same time on the M models and the Maestro. You can add an external monitor to the M models for 1920×1200 display which is very cool. Nice to hear from you and thank you for adding the additional information. With Flex coming out with the new pricing and the 6400/6600 radios, I’m certain they will be a success. As another Ham on here pointed out, the 6400 would be a good option and it’s only $1,999. I think that would make a good companion for the Icom IC-7610. Thanks for the nice comment and I hope to hear you on the air. As a digital operator mainly I am disappointed that both receivers can’t be outputted to a USB port on the 7610. You can on the Flex. My solution to full diversity and twin receivers on digital costs only $995 at the moment and that’s a second 7300!!! Nice to hear from you. There are two USB ports on the rear and one is a USB 3.0. Maybe there is a workaround somewhere in the works??? I remember before the 7300 came out, no one I talked to knew it could do FSK. When I received mine it didn’t take long to have RTTY (FSK) setup and running on MMTTY. Hopefully, there are a few nice surprises with the Icom IC-7610 and something to address your point. I’m keeping my IC-7300, so maybe I’ll have to use it. Thanks for coming by and commenting and I hope to hear you on the air. I have been a 100% SDR guy for a long time now, but I have to say, the Flexradio ‘aint a looker. The 7610 looks like a ham radio. The 6500 looks like they made the box bigger and glued a Maestro to the front. It actually has a better touchscreen than a Maestro but the layout is the same. that said the Icom looks like they put the case on upside down. Why the curves on the bottom and not on the top? Personally I would say, if you want the knobs buy the Icom, you wont be disappointed. If you don’t need the knobs, buy the FlexRadio6500 model without the knobs. Thanks Andrew. Nice to hear from you and I thought the same thing about the 7610 case hi hi. Then I look at my 7300 and the curves are on the bottom, just no silver (chrome) trim. I think you’re spot on. If a guy wants a SDR traditional style radio, it’s the Icom. For software or computer guys the Flex will be great and they’ll save a lot of money on the Flex 6400 without the knobs on front. The resolution is what get’s me. It’s going to look really nice on a big screen. Thanks for this, I know its a simple look but you have to start at the 50000ft view and drill down! Like you I have a number of radios here, I have the 7300 sitting next to a TS990 and a TS590SG. I sold off a Flex6500 and 6300. I’m watching the Flex guys closely, as well as how the 7610 will roll out. frankly I was more than surprised at the $3900 price but this is Q4 for Icom as well as the resellers, so orders at a high margin are at the top of the list!! the hobby is fun for a lot of reasons, new Technology is always a blast! and using the TS990 in SS Contest is smooth and clean!……and the 7300 is holding his own! 🙂 and running the SPE 1.3 its easy to hold a freq with either radio. I’m glad Flex and Icom are working on keeping investments in to Ham Technology! Nice to hear from you. Yes, when I started digging down and looking at the real specifics and capabilities between the two radios, some information is hazy at best. For instance, SO2R, SO2V, full duplex, independent receivers and so on. I went with what I knew. I understand Flex just started new pricing structure of sorts. Maybe that’s why the Flex 6400M is $2,999. I’ll be watching them close too. Other’s commented that Icom influenced Flex to add knobs. It’s not a separate unit like the Maestro.